I never thought of "deaf culture" and "hearing culture" as being separate, or even opposed. But apparently, at least to the families in this documentary, they are. Have you ever heard of the Cochlear Implant? I can't give you a technical description, but it's a device that can be implanted inside the head to help deaf people - completely deaf people - hear. I first heard of it years back when Rush Limbaugh got one, after his hearing started to decline. Today he is almost completely deaf, and even though he has the implant, he got it as an adult, and so he has to lip read or have incoming calls to his radio show transcribed. 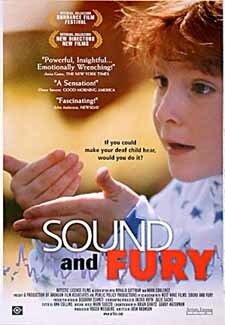 Sound and Fury is about two families with deaf children - one deaf family, one hearing family - who are considering getting Cochlear Implants for their children. Just the decision, the consideration, shakes up their lives and strains their relationships in ways I honestly would not have expected. The deaf parents considering a Cochlear Implant for their 5-year-old daughter, Heather, are very hesitant about pursuing the implant. Heather found out about it (I believe from her hearing grandparents) and started asking for one. Heather's parents are very devoted to deaf culture and deafness. They do not see their deafness as a handicap, but rather as a different skill set and a different culture. They take Heather's (and their parents') interest in the Cochlear Implant almost as an insult, because they take pride in being deaf and believe this implant will cause Heather to see herself (and them) as handicapped, as defective, as not part of the "normal world." A hearing friend brings up that she would never be able to hear music, for example, which is a big concern I would have. Their response? "We don't care about music. Who needs it?" The impression the docu gives (and who knows how accurate this is) is that Heather is being coerced by her grandparents to want the implant, and pressured by her parents to not want it. Both couples insist Heather "made her own decision" to either want or not want it. And it causes a huge rift between the generations. The hearing parents are the brother and sister-in-law of the deaf parents. The sister-in-law is from a deaf family, and their infant son is also deaf. They want to implant him as a baby so that his speech and hearing skills will develop as he grows. The deaf grandparents are hurt by this. Again, they view it as a rejection of part of their identity, and battle with their daughter over it even in the waiting room during the implant surgery. They are told by their deaf friends, deaf families, and even their doctors that they should expect judgment and rejection from the deaf community because they chose to implant their son. One thing they brought out I thought was very interesting. The doctors and speech therapists told the deaf family was that, once Heather was implanted, she had to stop signing completely, because children who sign are less likely to develop speech skills at a normal rate and it can either delay or totally inhibit speech development, because they already have a means to communicate and really don't need to work on their speech skills. You can take that for what it's worth, but I thought it had interesting implications for the current trend of hearing parents teaching hearing children sign language before they can speak. Anyway, I really enjoyed this documentary because it let me step into a culture I didn't have any personal experience with, and it caused me to consider many things from a new perspective. Can't ask for more than that, right? Did you watch this week's documentary? What did you think? Honorable Mention: The Third Jihad. A self-described moderate Muslim investigates the current war against the West by what he styles "Radical Islam," and how there is a fully-functioning battleground in the United States most people are not aware of. I debated whether or not to do a whole post on this one and decided not to. I'd rather you just watch it yourself. Next week's documentary: Expelled: No Intelligence Allowed. I'm a graduate student studying for my doctorate in Audiology, so if you have any more questions about Cochlear Implants, let me know! I'm just finishing up my clinical rotations working with them. That looks really interesting! I added it to my Netflix queue! I sent this to my SIL. She just did a pretty large research paper on deaf children. I proofed it for her (and may or may not have lowered her grade a bit but that's neither here nor there) and learned quite a bit from it. Very interesting stuff. I love that you pointed out the whole teaching hearing kids to sign thing. A lot of people suggested this to me, but I never quite felt right about it for that reason. I can see why it's tempting.. to get through that frustrating phase of your child not being able to communicate his needs, but what the doctor said makes total sence to me. Why make the effort to start talking when signing already gets your point across. I'll add this one to my list too! I have to disagree with your take on signing with baby, have you done any actual research on this? How about those late talking toddlers? Signing has given these children who chose to hold off on speech a way of expressing them self, thus giving them confidence that will one day help them speak. Also even in babies they have research backing up that signing is good for language development! Researchers ,such as National Institutes of Health, have conducted studies that revealed signing Signing helps intellectual development and emotional growth! Also signing helps children learn to talk easier, and even faster! Also signing with baby is not a new trend. My mother in law signed with all her kids, my husband was a late talker but with a ERY high IQ. My oldest SIL was a very early talker. It really depends on the child. Signing has helped them all though. Actually the signing my mother in law taught her autistic daughter (before she even found out about the autism) has greatly helped improve the communication between them! I sign with my son who is only 11 months and I'm able to reach his needs better since he can tell me to home here, to breastfeed him, or he wants to eat! I think signing is a great thing! I did a research paper for this for my college anatomy class and found the same things over 10 years ago. The only thing that shocked me was how people that were deaf did not see that as a handicap. I say how could they not? We live in a hearing world. Why wouldn't you want your child to hear even though you couldn't. Isn't that almost the same as denying your child an education if you are illiterate? Wouldn't you be fearful of your child seeing you as dumb if they were educated? I didn't get it, it seems selfish to deny a child the ability to hear regardless of your own personal views. Not hearing is a handicap.